The Fall 2016 issue of the Journal of the History of the Behavioral Sciences is now online. Articles in this issue explore the work done by psychologist William McDougall (right) during his time in the United States, the Chicago Committee on the Behavioral Sciences during the mid-twentieth century, the development of the National Anthropological Film Center, and more. Full titles, authors, and abstracts follow below. 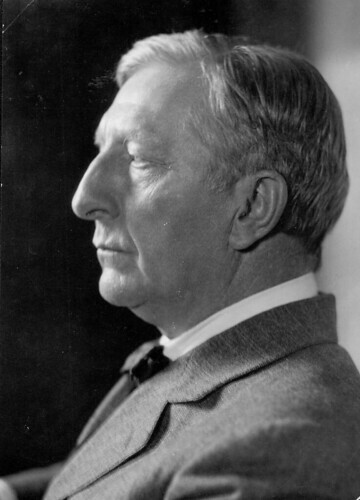 The British-born psychologist William McDougall (1871–1938) spent more than half of his academic career in the United States, holding successive positions after 1920 at Harvard and Duke universities. Scholarly studies uniformly characterize McDougall’s relationship with his New World colleagues as contentious: in the standard view, McDougall’s theory of innate drives clashed with the Americans’ experimentation into learned habits. This essay argues instead that rising American curiosity about inborn appetites—an interest rooted in earlier pragmatic philosophy and empirically investigated by interwar scientists—explains McDougall’s migration to the United States and his growing success there. A review of McDougall’s intellectual and professional ties, evolving outside public controversy, highlights persistent American attention to natural agency and complicates arguments voiced by contemporaries in favor of nurture. The Chicago Committee on the Behavioral Sciences occupies a special place in the eponymous movement. Involving prominent figures such as psychologist James G. Miller and neurophysiologist Ralph W. Gerard, this committee embodied the common belief among behavioral scientists that a cross-disciplinary approach using natural science methods was key to understanding major issues facing mid-century American society. This interdivisional committee fell under the jurisdiction of both the natural and social sciences. As such, its flagship project, an institute of mental sciences, had to face the reluctance both of natural scientists who thought it inadequately scientific and of social scientists who regard its efforts as too narrow in scope and too biological in orientation. Though it failed in its main objective to create an institute, the committee was a formidable instrument of intellectual stimulation and socialization for its members. It provided them with an opportunity to familiarize themselves with each other’s scientific backgrounds, practices and jargons, realize the significance of academic cultural differences and learn ways to accommodate them. This article analyzes the development of the National Anthropological Film Center as an outgrowth of the Smithsonian’s efforts to promote a multidisciplinary program in “urgent anthropology” during the 1960s and 1970s. It considers how film came to be seen as an ideal tool for the documentation and preservation of a wide range of human data applicable to both the behavioral and life sciences. In doing so, it argues that the intellectual and institutional climate facilitated by the Smithsonian’s museum structure during this period contributed to the Center’s initial establishment as well its eventual decline. Additionally, this piece speaks to the continued relevance of ethnographic film archives for future scientific investigations within and beyond the human sciences. This paper proposes a new approach to the study of sociological classics. This approach is pragmatic in character. It draws upon the social pragmatism of G. H. Mead and the sociology of texts of D. F. McKenzie. Our object of study is Norbert Elias’s On the Process of Civilization. The pragmatic genealogy of this book reveals the importance of taking materiality seriously. By documenting the successive entanglements between human agency and nonhuman factors, we discuss the origins of the book in the 1930s, how it was forgotten for 30 years, and how in the mid-1970s it became a sociological classic. We explain canonization as a matter of fusion between book’s material form and its content, in the context of the paperback revolution of the 1960s, the events of May 1968, and the demise of Parsons’ structural functionalism, and how this provided Elias with an opportunity to advance his model of sociology. The winter 2014 issue of the Journal of the History of the Behavioral Sciences is now online. Included in this issue are articles describing the development of mine detector dogs during World War Two, late-nineteenth century advice on improving natural memory, parallels between debates over Robert Owen’s role in the history of sociology and contemporary sociology, and the roots of sociologist William Foote Whyte’s Street Corner Society. Full titles, authors, and abstracts follow below. The utility of the dog as a mine detector has divided the mine clearance community since dogs were first used for this purpose during the Second World War. This paper adopts a historical perspective to investigate how, why, and to what consequence, the use of minedogs remains contested despite decades of research into their abilities. It explores the changing factors that have made it possible to think that dogs could, or could not, serve as reliable detectors of landmines over time. Beginning with an analysis of the wartime context that shaped the creation of minedogs, the paper then examines two contemporaneous investigations undertaken in the 1950s. The first, a British investigation pursued by the anatomist Solly Zuckerman, concluded that dogs could never be the mine hunter’s best friend. The second, an American study led by the parapsychologist J. B. Rhine, suggested dogs were potentially useful for mine clearance. Drawing on literature from science studies and the emerging subdiscipline of “animal studies,” it is argued that cross-species intersubjectivity played a significant role in determining these different positions. The conceptual landscapes of Zuckerman and Rhine’s disciplinary backgrounds are shown to have produced distinct approaches to managing cross-species relations, thus explaining how diverse opinions on minedog can coexist. In conclusion, it is shown that the way one structures relationships between humans and animals has profound impact on the knowledge and labor subsequently produced, a process that cannot be separated from ethical consequence.